German jurist, economist, and deputy; born at Frankfort-on-the-Main July 20, 1819; died at Berlin March 29, 1880. He was the son of a wealthy jeweler, and the grandson of Gumpel, the rich Hamburg banker. He studied law at Göttingen, Heidelberg, and Berlin, and sought to establish himself as privat-docent at the University of Berlin; but not even the influence of Bettina von Arnim could at that time secure from the great jurist Savigny this right for a Jewish applicant. Oppenheim finally secured the right at the University of Heidelberg, where he taught "Staatswissenschaft" and "Völkerrecht" from 1841 to 1845, during which period he began his literary activity by the publication of "Studien der Inneren Politik" and "Geschichte und Staatsrechtliche Entwickelung der Gesetzgebung des Rheins" (1842). In 1843 he contributed to thesecond volume of Weil's "Constitutionelle Jahrbücher" the essay "Staatsrechtliche Betrachtungen über Regierungsfähigkeit und Regentschaft, mit Besonderer Rücksicht auf die Thronfolge in Hannover," in which he opposed the succession of Crown Prince George. His next work was the important "System des Völkerrechts," Frankfort-on-the-Main, 1845 (2d ed. Stuttgart, 1866). 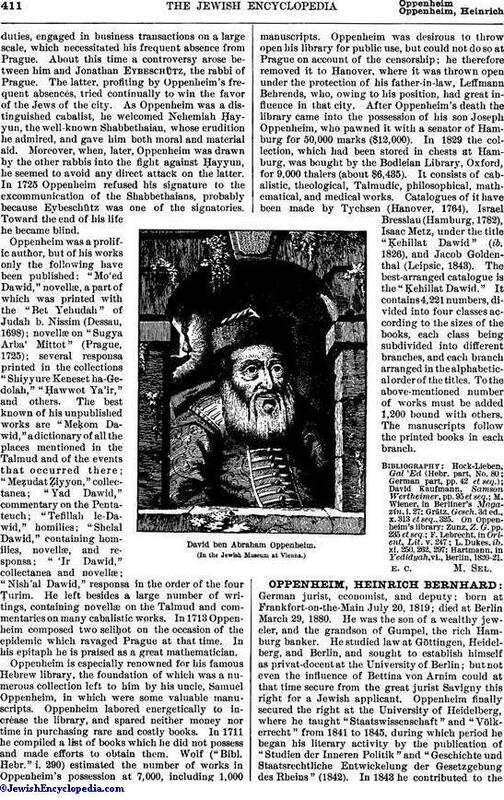 Oppenheim then went to Berlin to participate in the agitation that culminated in the revolution of 1848, and, with Arnold Ruge, founded the journal "Die Reform." In 1849 he went to Baden and participated in the revolutionary movement there. In May, Brentano, the leader of the provisional government, appointed Oppenheim editor of the "Karlsruher Zeitung," in place of Karl Blind. When differences arose between Brentano and Struve, Oppenheim supported the latter in his attempt to secure the leadership; but the result was not favorable, and Oppenheim left Baden to travel in Switzerland, France, Holland, and England. He returned to Germany in 1850 and published his "Philosophie des Rechts und der Gesellschaft," Stuttgart, 1850. This was followed by a number of political writings, mostly of a controversial character. 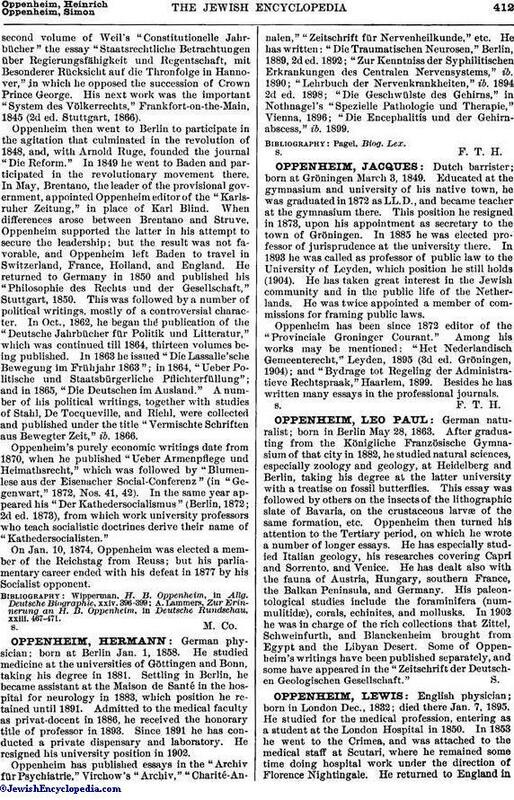 In Oct., 1862, he began the publication of the "Deutsche Jahrbücher für Politik und Litteratur," which was continued till 1864, thirteen volumes being published. In 1863 he issued "Die Lassalle'sche Bewegung im Frühjahr 1863"; in 1864, "Ueber Politische und Staatsbürgerliche Pflichterfüllung"; and in 1865, "Die Deutschen im Ausland." A number of his political writings, together with studies of Stahl, De Tocqueville, and Riehl, were collected and published under the title "Vermischte Schriften aus Bewegter Zeit," ib. 1866. Oppenheim's purely economic writings date from 1870, when he published "Ueber Armenpflege und Heimathsrecht," which was followed by "Blumenlese aus der Eisenacher Social-Conferenz" (in "Gegenwart," 1872, Nos. 41, 42). In the same year appeared his "Der Kathedersocialismus" (Berlin, 1872; 2d ed. 1873), from which work university professors who teach socialistic doctrines derive their name of "Kathedersocialisten." On Jan. 10, 1874, Oppenheim was elected a member of the Reichstag from Reuss; but his parliamentary career ended with his defeat in 1877 by his Socialist opponent. A. Lammers, Zur Erinnerung an H. B. Oppenheim, in Deutsche Rundschau, xxiii. 467-471.